At Camping Altomincio your children are the center of attention! They will for sure have a fantastic holiday where they can spend a great time in the large waterpark. This modern campsite is situated in a beautiful green area and is suitable for young and old. 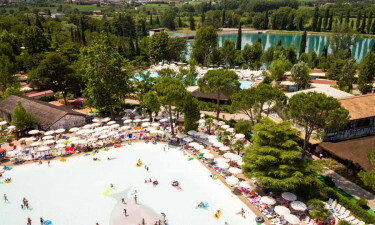 Camping Altomonincio is a paradise for families with children and is just 5 kilometers from Lake Garda. The site lies on the river Mincio in a green and peaceful environment. This place used to be a water park and was completely renovated in 2009. Now it is a modern campsite with a big water park. 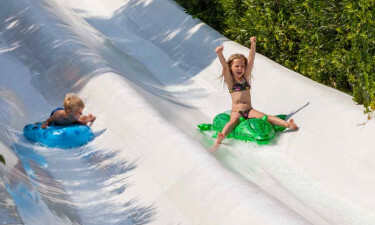 In the park include slides, lagoons, a lazy river and you will find a large pool, enough water for many hours of fun and entertainment for the whole family. There are also many other activities. During the day there is a professional animation team and a playground for the youngest ones of the family. There are also several sports facilities in the park. Altomincio Family Park has an excellent restaurant with bar and terrace. Here you can enjoy a nice cold drink or dine out. For walks in the area, Altomincio is a very good starting point. Take for example the pittorske port town of Peschiera del Garda where you can stroll along the promenade. The famous theme park, Gardaland, is nearby and the beautiful cities of Verona and Venice are also well worth a visit. Further, there are beautiful Italian villages like Borghetto sul Mincio, where olive trees, vineyards and lemon trees are found.